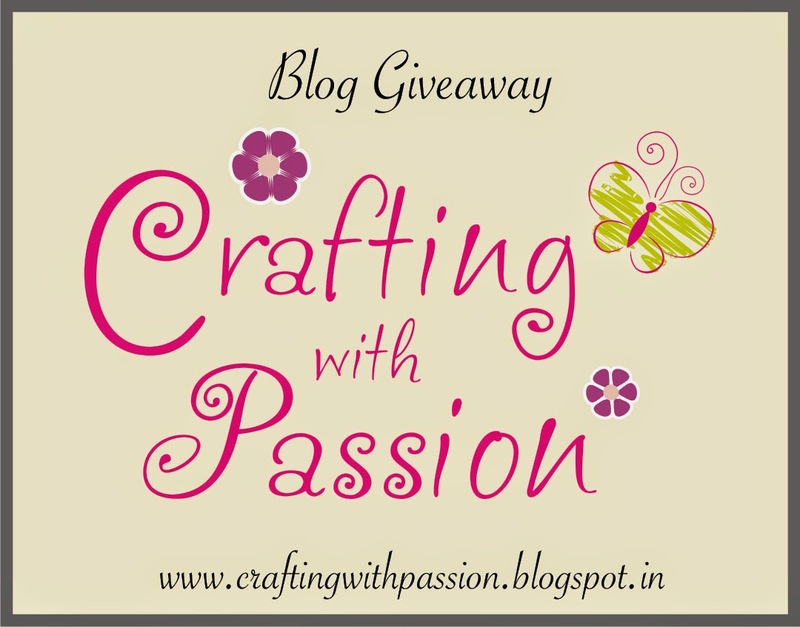 Crafting With Passion: Yippee.... Blog Candy!! Hope i continue blogging with as much enthu as i had on my 1st blog post. And sorry for the late post again. I had a new logo designed for the blog, so i thought this would be an appropriate time for using it, that is why the couple of days delay. Coming to the point, this blog candy had been on my mind for a long time but due to time constraint i wasn't able to come up with this sooner. When i first started blogging each & every comment was soo exciting(it still is). I can still remember Snehal Welde, Dr. Sonia, Deepti, Sindhu & few were among the first to comment and it really was soo thrilling. Also the constant encouragement i got from fellow crafters.... i means a lot to me. So this blog candy is a token of thanks to all my friends and well wishers. The first lucky duck gets a yummy Rs. 600 GV from Priya's The Craft Shop. And if i get more than 20 entries then ill choose a second winner who will get a Rs. 400 Gift Voucher. If not then the GV goes to any of my favourite person. The link closes on 10th Sep, and ill announce the winners on 14th Sep. Guess what, We complete 5 yrs of matrimony, something more to celebrate right. Perfect timings!! Let me try to keep it simple. 4. If you also post this image on your FB timeline along with a link to my blog, then YOU can add your name twice into the name pool. Thats it guys. Have fun & keep crafting. Now go ahead and link up! Wow! So many things to celebrate 101th post , 5th Anniversary ,new logo ..! Congrats Sujana and loved the way of sharing your celebrations through candy ! Hi ,just dropping by to tell you that I have shared about your give away in my recent post ! I loved your new logo the moment I saw it. It does reflect your style of creativity. Congrats and wishing you loads of love and success in the coming days. Great way of sharing this special occasion with everyone. Thanks!! I'll do the needful to participate. Your work is always very beautiful and so unique from others. What I like most about it is you combine beauty with practicality! Keep up the good work. I've shared on my sidebar and facebook page and my blog post too! Hi Sujana, congratulations on the 101 posts and your 5th anniversary !! love your work and your new logo.I have shared about your giveaway on my blog post http://kalasirjana.blogspot.in/2014/09/altered-mobile-cover.html and on my sidebar and FB :) best wishes and Happy crafting ! !